SKU: 7304. Categories: Shop All ThinLine Products, Endurance Saddle Pads, Western Saddle Pad Liners, Western Correction saddle pad, Western Horse Tack, Therapeutic Saddle Fitting Pads. Tags: barrel saddle pad, endurance saddle pad, Orthopedic Therapeutic Saddle Pads, rounded skirt, western liner. A raised wither profile with a swallow topline makes this pad adaptable to the conformation of any horse – high withered or mutton withers. And the flexibility and stretchiness of the ThinLine molds around your horse’s shape. The contour of the pad, which follows the natural curve of your horse’s back, stops any bunching. This thin pad frees up more room for narrow or snug-fitting saddles and improves the comfort for horses even with saddles which are perfectly fitted. The ThinLine also ventilates, across the pad, allowing excess heat to move out from under the saddle. Most important, to your horse, is how this pad creates stability. The slim design puts you in closer contact with your horse, so your leg can easily drape giving you a seamless feel of his sides. You’ll notice his back moving more, but with the extraordinary shock absorption of ThinLine, you will be moving in unison with your mount. The ThinLine layer sewn onto the pad has a 95% shock absorption rate that spreads impact LATERALLY along the pad. This means that the motion you feel under you as you ride is absorbed by the ThinLine and transferred ACROSS the pad instead of UP into your spine. And this same shock absorption benefit is being enjoyed by your horse as well. With the reduced movement of your seat, your balance is easier to keep so “staying” with your horse becomes second nature. You sit quieter, and he responds with a relaxed, softback, and freer strides. Contoured wither profile is designed for high withered horses. Pocket to add shims for saddle fit adjustment allows you to fill in behind the wither, across the sway in the back and lifting of the cantle. Shims (sold separately) are made of the same amazing ThinLine, delivering the most in comfort and fit for your equine partner. Machine washable – with or without shims, all you do is toss this Western cotton saddle pad in the washing machine. 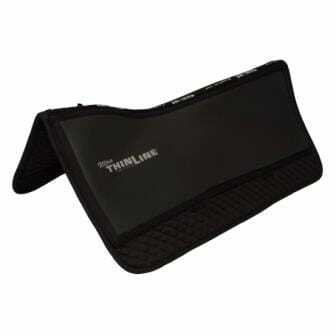 ThinLine helps riders sit the gaits and delivers the ultimate close contact feel. Nonslip ThinLine creates a steady connection between you and your horse. Front, Bridging, Rear Shims. Sold in pairs. Underneath the ThinLine layer is a full pocket to insert saddle fitting shims. Either click here or, Once you place this performance saddle pad in your shopping cart you will see, below your cart, Saddle fitting shims for pad. Simply add the shims you need. Front Shims: Provide lift in the wither area and are available in two thicknesses. Bridging Shims: Fill in over the top line. Available in two thicknesses. Rear Shims: Lift the cantle of the saddle for perfect balance. Available in two thicknesses. Kits available for purchasing multiple shims. Once you receive your pad, ride in it for at least a week. At first, you may simply notice things like; “my horse was great today, my seat and aids were soft and effective”, great job! you are on your way. You will see daily improvement. But, this can be a bit subtle in the beginning. How to check out your pads effectiveness: After at least a week of riding daily, begin your warm-up with the ThinLine. Once you are warmed up, remove the ThinLine and ride. This is when you will see just how much your horse is loving their saddle pad. Order saddle fitting shims saddle pad liner in your cart, the product Add Saddle Fittin Shims to the Pad in My Cart will appear below or click here: Western Saddle Fit Shims View the product gallery – ThinLine shims are shown on top of the pad to demonstrate size and shape – you will actually place them inside the pad. Shims will not shift, even in washing, once inserted. Use Coupon Code ThinLine for savings. Round Skirt 24.75″ spine length | 15″ drop round skirt | 8.25 inches of Ultra ThinLine drop. Medium 28″ spine length | 12″ drop, 9 inches of Ultra ThinLine drop. Machine wash cold in front loading washer. Turn the ThinLine to the inside. Spin to remove excess water. Hang to dry naturally with no heat source, including sun. Using a fan speeds the drying process. If you have a white pad, you may use bleach products such as soft scrub on the ThinLine material as well as using a little bleach in the wash cycle. All pads come with a one-year full replacement warranty when following our care instructions. When care instructions are followed, our cotton pads are proving to have an expected longevity of 7-8 years. I have the Cordura Fleece Western Pad. It fits well. My horse’s movement in his back is looser and freer. I highly recommend it. “I’m very happy to report that after a week of riding 10+ to 20+ miles a day the ThinLine pad kept our horses very happy. I was very nervous about making this purchase at first but I’ve have had the original pad for a long long time and know they work. I have a very mutton withered mare and she had no sore places this week! Thanks, The Smiths.” – Amanda Maschmeyer Smith. Julie O’Brien decided to give the ThinLine Western Cotton Liner Pad a try and was very glad she did. Julie’s AQHA mare, Tangaray not only shaved a second off her time but Julie also took home a nice paycheck. Julie credits the ThinLine pad with helping her mare. Amber Everson: My horse seems to love the one I bought. It has a nice grip to it and seems to cushion well. Julie O’Brien: Got one for Christmas. I can feel my horse move! Will be running barrels tomorrow in it. Lisa Haaparanta I have been using mine for the last few weeks on my 5 yr old mare. I absolutely LOVE it!!! She’s sensitive but is so comfortable with the pad that training is progressing quite smoothly. I’ve used it on my 10yr old AQHA mare who is arthritic through her shoulders and she is so free in the shoulders when I use it she may just be able to head back to the show pen again!! Will definitely be buying another!! I was sold on purchasing a Thinline pad thanks to YouTube video reviews regarding their impact protection for both horse and rider. I emailed Thinline for advice because I wasn’t sure which design would be best for my mule’s needs. Their employee Lisa Beam was both friendly and helpful. I ended up selecting this pad based on her recommendation and am extremely pleased with this design. It’s easy to care for, helps with my saddle fit, and supports my mule’s back while allowing for close contact. Very nice to feel more close, considering my previous, thicker pad was supportive but had less feel. Will be a repeat customer for sure! I’m a Western Dressage rider and needed a thin pad that would allow me close contact with my horses but protect their backs as well. I ride in a customized Western Dressage saddle with a drop rigging. Thin Line made me the medium Western Cotton modified with drop rigging leathers. The change in my horses way of moving has been amazing. Their scores have increased and the older 16 yr old QH mare finished 2016 as a High Point Champion for GA. Both horses finished in the top 50 Nationally. I’m interested in the round barrel pad, but I’m not sure on what shims to order with it, and do they coast extra for each shim? Hi Cynthia, The shims are sold separately. You will need to know the item number (sku) for which pad you are wanting. It will be listed on the website. Then you would find that number in the western shim pad option (see this link https://www.thinlineglobal.com/shop/western-saddle-pads/western-saddle-fit-shims-inserts). You then pick the type and thickness. Lastly, the size. All the barrel pads are small. Hope that helps. If you have any difficulties, please do not hesitate to call the ThinLine office for assistance. I now own 2 Thinline pads, the latest being the Western Cotton Liner and my super sensitive mare LOVES these pads. They make such a difference in her freedom of movement and the breathability of this pad is the best I’ve found…where other pad materials tend to hold the heat in, the Thinline is so breathable it just doesn’t heat up. Wish there was a Canadian distributor for the western pads as I’d like another one! Do you make a pad for Australian saddles? Thanks for your question Leslie! Please check out our endurance and drop rigging pads. These cross over pads are great for a number of different saddle styles, including Australian saddles. We recommend checking the measurements to be sure it is the right fit for your particular saddle. Thanks for your question! This pad is durable enough to use on its own and is also thin enough to use as a liner under a show pad. If using on its own, the Ultra ThinLine panels and the high quality, quilted cotton will provide all of the protection your horse needs while still giving you a close feel.